Thou shalt thank the Lord thy God in all things (D&C 59:7). First, God divided the light from the darkness, making day and night. Then, on the second day, He organized the heaven and the earth. On the third day, He divided the land from the waters and created grass, flowers, trees, fruit, and herbs. On the fourth day, He created the sun, moon, and stars. The fish and fowl were created on the fifth day. On the sixth day, Jesus Christ created the animals. Then Heavenly Father created man “in his own image, in the image of God created he him; male and female created he them” (Gen. 1:27). What a great deal we have to be thankful for! Life’s whole experience and all the beauties around us are gifts from our Father, who loves us. Instructions: Color the flannel-board figures, then mount them on heavy paper. 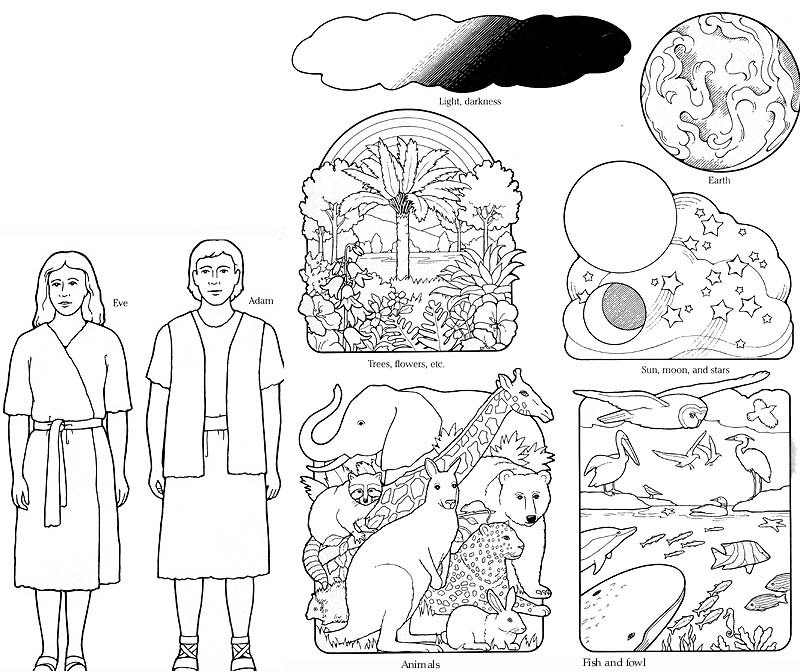 Cut them out and use them to retell the story of the creation of the earth. Eve; Adam; Light, darkness; Earth; Trees, flowers, etc. ; Sun, moon, and stars; Animals; Fish and fowl.